German casualty figures for World War I remain notoriously difficult to reconstruct. The sheer scale of losses challenged record-keeping at every level. The problem was further exacerbated by, let us say, flexible standards for defining a wound. Those points made, it can reasonably be stated that almost a million German soldiers were killed in action or died of wounds in 1916, at Verdun, on the Somme, and everywhere else from East Africa to Lake Naroch that the tides of war carried them. Casualties do not of themselves determine who is winning or losing a war. Nor do they determine the competence of commanders or the effectiveness of governments. But neither can they be dismissed as collateral damage, the cost of doing business. As early as midsummer 1916, Falkenhayn was showing signs of stress. The vultures in Berlin and at OHL headquarters were beginning to circle. And the Russian high command tried once more for a conclusion in the field. Russia had made an unexpected recovery from the debacles of 1915. Domestic production of weapons and ammunition reduced dependence on Allied imports. Grain reserves had more than doubled. Over six million men were under arms. And as the French calls to relieve the pressure at Verdun grew more strident, a new general offered a new plan. Alexei Brusilov, commanding the Southwestern Front, proposed to attack along the entire 350 miles of his four-army sector, each army in a particular zone. This would give the enemy no idea of which was the main effort or where the next blow would be struck. 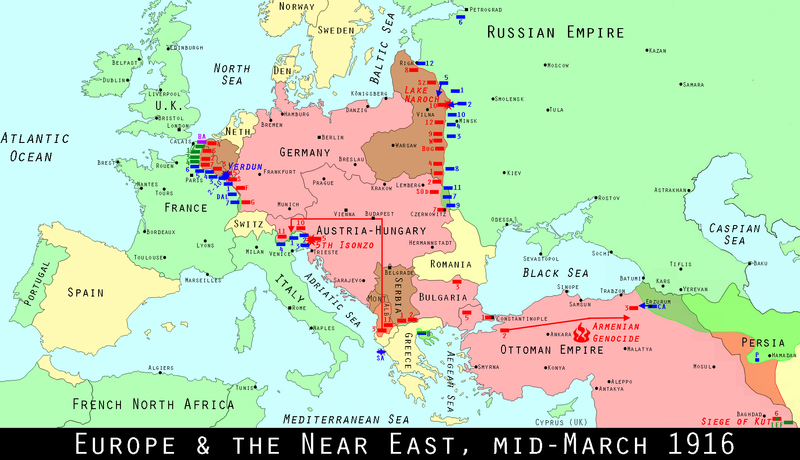 An overextended and demoralized Austro-Hungarian defense collapsed almost immediately. Falkenhayn scraped up ten divisions and enough artillery to stabilize the front, taking de facto charge not merely of the immediate fighting but virtually the entire Habsburg war effort. The military and economic responsibilities accompanying that shift had little time to manifest before they were compounded by Romania’s August entry into the war on the Allied side. That kingdom hoped to gnaw the Dual Monarchy’s carcass in the wake of Brusilov’s successes. Its army proved spectacularly ill-prepared for the kind of war the Central Powers had learned how to wage, but it was Germany that was constrained to provide the bulk of the forces and planning for the Central Powers’ offensive against Romania. It furnished the commander as well. The initial success of Brusilov’s offensive had led to increasing pressure from Bethmann-Hollweg and the Foreign Office, and within the High Command, which had relocated to Pless in Silesia, to turn over full command in the East to Hindenburg/Ludendorff. Falkenhayn resisted successfully-as long as he had the support of the Kaiser and those of his immediate advisors who as late as mid-July saw Falkenhayn as “a card . with which one either wins or loses,” whose sacrifice meant the end of William’s remaining credibility. Romania’s decision for war tipped the balance. At 11 pm on August 28 Falkenhayn received Imperial notice of his relief. The next morning Hindenburg appeared at High Command headquarters. At precisely 1:26 pm Erich von Falkenhayn boarded a train out of Pless. He did not exactly vanish into obscurity. As a consolation prize and an opportunity for rehabilitation, Falkenhayn was given command of the Ninth Army, the assignment of driving the Romanians back across the border, and the constraint of completing the campaign before winter. Falkenhayn responded by emphasizing “speed and relentless attack.” Movement and assault would keep the Romanians so off balance that they could neither plan nor react before the next sequence shifted the paradigm again. This proto-blitzkrieg, implemented in one case by an improvised mechanized force, ranks with the Serbian campaign of 1915 as a tactical and operational cameo: the German Army at its best. On the other hand, like its predecessor, its scale was small. Its enemy was even more obliging in terms of decisions taken and blunders made. Nor did Falkenhayn’s cauterizing of a single running sore proffer guidelines to the comprehensive military and political challenges confronting Germany’s new command team. The Hindenburg-Ludendorff appointment reflected and projected Germany’s situation. They were worked in as a command and planning team. Hindenburg described their relationship as like a successful marriage: neither party consistently dominant, each bringing something vital to the mix. Ludendorff was a manager and an organizer, talents reflected in his official title of First Quartermaster-General. Intelligent and industrious, a master of detail yet able to maintain a sense of general situations, he was at his best as a problem-solver with no time left over to indulge the irritability and anxiety that were the negative sides of his character. To an army badly shaken by Verdun, the Somme, and their aftermaths, Erich Ludendorff provided a sense of grip as welcome as it was badly needed. If Ludendorff was a serious version of Gilbert and Sullivan’s “model major general,” Hindenburg modeled a traditional Prussian general, arguably to the point of caricature. Solid of body, with a near-literally square head and appropriate facial hair and facial expression, he looked the part-a point to be neither overlooked nor mocked in an era of photography and newsreels. He projected an air of imperturbability: nothing seemed able to bring him out of countenance. And Hindenburg was popular, both as a public figure and in the corridors of power. But were they hommes connetables, capable of fulfilling the military responsibilities they were assigned and the economic and political ones they would assume? The overwhelming consensus is that their inheritance was poisonous, nurturing an already potential combination of militarism and expansionism at the expense of wisdom and caution. Too often overlooked is a counterpoint: Germany in 1916 had no one else. When the army is specifically considered, there is an obvious void in the second generation, the mid-levels of staff and command. A first-rate crop of third-generation figures were emerging: Seeckt, Lossow, Rohr, Leith-Thomsen, and those yet unidentified, like the recycled reservist who would revolutionize artillery tactics in the next year, and the infantry captain whose feint-and-strike tactics in the mountains of northern Italy prefigured the methods of a later, greater war. But these were junior ranks: majors and lieutenant colonels. Their counterparts among the movers and shakers in the High Command, officers like Max Bauer and Gerhard Tappen, suffered from over-tempering: an involvement in situations beyond their maturity and judgment that began in the war’s early weeks. With the exception of Max von Gallwitz, it is difficult to identify, much less recall, any field commanders who began the war as colonels or Generalmajoren and had risen, or would rise, much above the level of what the British called “good plain cooks” and “safe pairs of hands.” Germany’s war was unlikely to end well in safe pairs of hands. Though it took time and lives, Britain and France eventually produced significantly deeper pools of senior military leadership that were unspectacular but able to shape the situation they confronted. Some, like Pétain, Foch, and Douglas Haig, grew incrementally into their responsibilities. Others-Fayolle and Mangin, Currie, and Monash-emerged from the ruck of war. Even Italy came out of the Caporetto disaster militarily revitalized, with Armando Diaz succeeding Luigi Cadorna. The parliamentary states, Britain and France, developed as well a body of effective second-generation political leaders. Lloyd George and Clemenceau had no counterparts in the Second Reich. Italy’s Vittorio Orlando is less familiar, but he rallied Italy and oversaw the destruction of an enemy army-something neither of the transalpine premiers achieved. None of these men were especially pleasant-intriguers, manipulators, and schemers all, often with private lives to match. They were, however, competent relative to circumstances. In contrast, compared to Britain’s George V, William II cut an abysmal figure as a figurehead. Bethmann-Hollweg’s successors as chancellor remain obscure even to doctoral students. And so it goes. Wherever one looks in Germany after 1916, the images are of cut-and-paste, of second- and third-rate people with first-line responsibilities. The structural reasons for that phenomenon are outside the scope of this book, except to note the development of similar phenomena in the other war-making empires, and suggest it was hardly coincidental. For present purposes, a case can be made that the Hindenburg-Ludendorff team filled vacuums as well as arrogated power in what was in good part a response to a comprehensive emergency that bade fair to escalate into a general crisis. The new command team turned first to the Western Front. 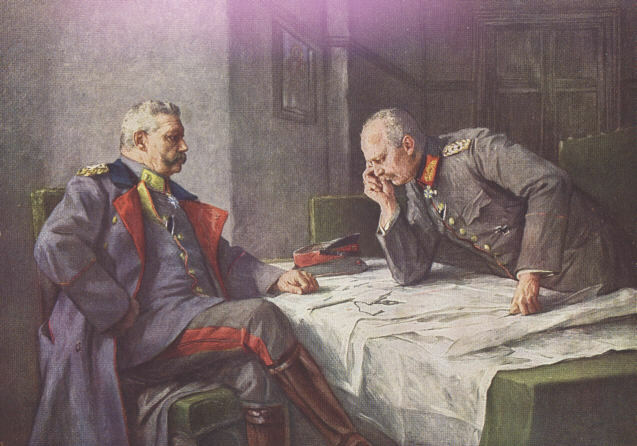 Hindenburg and Ludendorff had been too focused on events in the east-and on intrigues within the High Command- to be au courant with recent details and developments in what, mirabile dictu, was proving after all to be the war’s vital theater. It was his duty, Ludendorff stated, to adapt himself to the new conditions. He and Hindenburg began with a tour of inspection, visiting as many front-line units as possible, contacting others by phone, and demanding accurate information rather than eyewash and whitewash. Ludendorff came away convinced that the first months of the coming year would bring a battle deciding “the existence or nonexistence of the German people.” To meet that challenge, Ludendorff asserted, it was necessary to begin with the basics. German tactics must be revised on two levels: a general shift in emphasis to the defensive, and a specific set of coping mechanisms to check the increasingly effective Allied infantry and artillery team. In early September the High Command began systematically collating and evaluating recent frontline reports. On December 1, it issued Principles of Command in the Defensive Battle in Position Warfare. Ludendorff credited two relatively obscure and even more junior staff officers with constructing the manual that shaped German doctrines of defense in every theater for the rest of the war. But the fundamental ideas were Lossberg’s. Max Bauer and Hermann Geyer had previously served under him and absorbed his ideas. This was General Staff procedure at its best. Ludendorff’s ego was as large as anyone’s who held his kind of post is likely to be, but he applied it to generating and sustaining a corporate effort that had been less evident under Falkenhayn, who preferred keeping his own counsel. Bauer, a difficult man and a difficult subordinate, noted that Ludendorff’s style “lifted a great weight” from his working group. That opinion was as general in the High Command as any was likely to be among strong-willed men. It owed something to the Hawthorne effect generated by “an iron will and a firm determination.” It owed more to abandoning definitively the increasingly costly, increasingly futile, policy of holding and regaining the forward line at all costs. The objective of defense was described in the new Principles as making the attacker exhaust himself by establishing positions in depth, defended in echelons. As the Allied infantry advanced it would become disorganized. Its communications would be disrupted. It would eventually outrun the range of even its heavy artillery, to find itself caught in a combination maze and net. A complementary accompanying manual on Principles of Field Construction gave details: a three-tiered system with a lightly held outpost zone as a tripwire; a battle zone that could be as much as three thousand meters deep with a forward trench position, a network of strong points; and a second trench line protecting the artillery and the reserves in the rear zone which would mount the final counterattacks to destroy or throw back the enemy before he could consolidate his temporary gains and restore the original position, or as much of it as made no difference. Firepower was the revamped system’s framework: machine guns in the battle zone, artillery underwriting the counterattacks that were “the soul of the German defense.” Flexibility was the principle: “resist, bend, and snap back.” “Elastic defense” is a good capsule definition. So is “offensive defense.” But the system’s key and its core was human: “stout hearted men with iron nerves”-and individual initiative. Since 1914 falling back from a position had been defined as defeat, and carried an aura of disgrace. But by August 1916 it had become standard German operating procedure on the Somme to establish machine-gun positions outside the trench lines, in shell holes, to provide some protection from Allied barrages. Withdrawal was becoming instrumental, pragmatic: a means to the immediate ends of evading shell fire and wearing down attacking infantry, and to the ultimate one of setting the stage for the counterattacks that would reverse enemy gains. Promulgating the doctrine did not mean its automatic implementation. Senior officers and their chiefs of staff were expected and accustomed to think for themselves, and the circumstances of the Western Front in 1916 fostered coping more than conformity. Lossberg himself believed the new regulations gave front-line troops and junior officers too much leeway in deciding when and how far to fall back. Ludendorff responded positively to that kind of criticism, asserting that the new system was a work in progress, to be modified when the Allies attacked again. Arguably more important to the reform’s credibility was the extent that it codified and systematized much of what was already being done, and proving effective, on the Somme. The point was reinforced in mid-December, when the final French offensive at Verdun owed part of its success to the failure of German sector reserves to respond effectively because they were held too far behind the front. This entry was posted in Germany, Strategy by MSW. Bookmark the permalink.